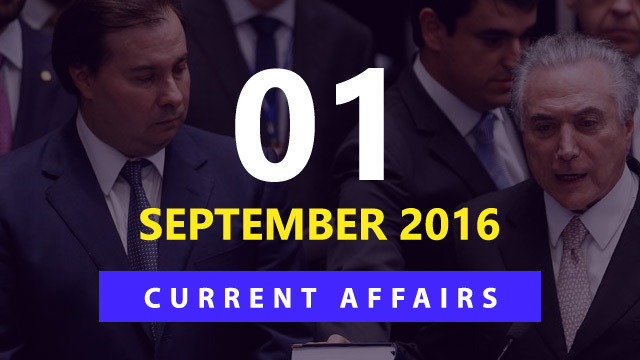 Hi Aspirants, here is the Current Affairs Quiz for 1 September 2016 useful for all competitive exams. 1. Who was on 31 August 2016 sworn in as the President of Brazil? Note: Brazil’s Senate has removed President, Dilma Rousseff, from the office for breaking budgetary laws. 2. Who among the following was recently appointed as United Nations Women’s Advocate for Gender Equality and Women’s Empowerment in India? 3. Union Defence Ministry has recently sanctioned the construction of a National War Memorial and National War Museum at? 4. Which state recently become the first state to distribute 2 crore LED bulbs under Unnat Jyoti by Affordable LEDs for All (UJALA) scheme? 5. Union Government has recently signed a memorandum of understanding (MoU) with Amar Chitra Katha to publish and distribute comic book on? 6. President Pranab Mukherjee on 1 September 2016 has given Maharashtra Governor C. Vidyasagar Rao additional charge of? Note: The tenure of Tamil Nadu Governor K. Rosaiah ended on 30 August 2016. 7. Goa Legislative Assembly has unanimously passed a resolution ratifying the amendments to the Constitution to pave way for the presidential assent to the Goods and Services (GST) Bill, 2016. Goa is the __th State Assembly to ratify the Bill? 8. Energy and Resources Institute (Teri) has recently appointed whom as the new Chancellor of Teri university? Note: He is the former Finance Secretary. With this, the University ended its last association with former Chancellor and Head R.K. Pachauri. 9. Which country recently amassed a world record one-day international total of 444 for three as they crushed Pakistan by 169 runs at Trent Bridge n the five-match series recently? 10. SBI Mutual Fund has recently appointed ____ as its Managing Director and Chief Executive? Now its time for review!!! Check your memory..click the Start Quiz button & rewind.